It's been a while since I've blogged on local weather patterns. As you know, we have several other methods to get your daily dose of MWN, including our Facebook and Twitter feeds, full-featured website and mobile web, as well as our mobile apps for iOS and Android, though this is our vehicle for the most in-depth discussions. Honestly, May is unbelievably crazy and there just is precious little time to maintain the blog. That's why I'm thankful for people like MWN intern/meteorologist (or "little mets" as he has been known to reference the #TeamMWN interns) Alex Herbst who contributes here occasionally as well. One reason why May is crazy busy - in fact the primary one - is MWN's contributions to Memphis in May. We are proud to be the official weather provider of the festival for the third consecutive year! That means that we have a presence on-site in the operations area in Tom Lee Park nearly every hour that the gates are open to the public, as well as providing ancillary forecasting services leading up to all events. It's time-consuming, but very rewarding to be part of an awesome team of staff and volunteers that make Memphis in May a huge success year in and year out! I'm also indebted to my loving and understanding wife (of 20 years this week!) and daughters, who I will have to reintroduce myself to this week! I'll have more on the Memphis in May experience in another post. In the meantime, let's turn our attention to weather for the week ahead. A cooler week is expected across the region in the wake of a cold front that arrives early Sunday morning. Clouds diminish Sunday with a northwest wind ushering in cooler, drier air that results in highs only in the mid 70s. It should be a delightful day overall. Monday will be similar, with cooler morning lows in the upper 50s and highs back to the mid 70s. Clouds increase late Monday ahead of a reinforcing cold front that arrives Tuesday. Moisture will be fairly limited but scattered showers are expected on Tuesday with the front. 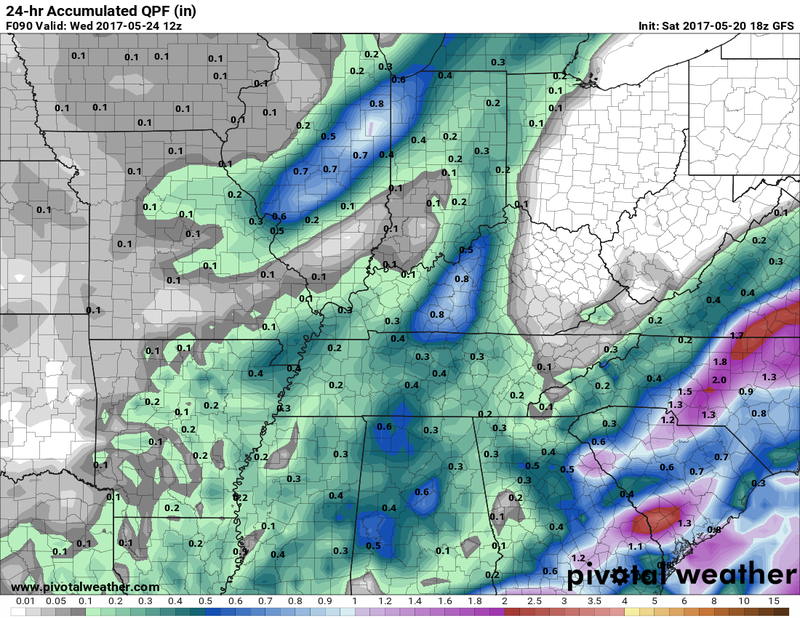 I'm not expecting a rain out or any major threats. Highs will remain in the 70s. 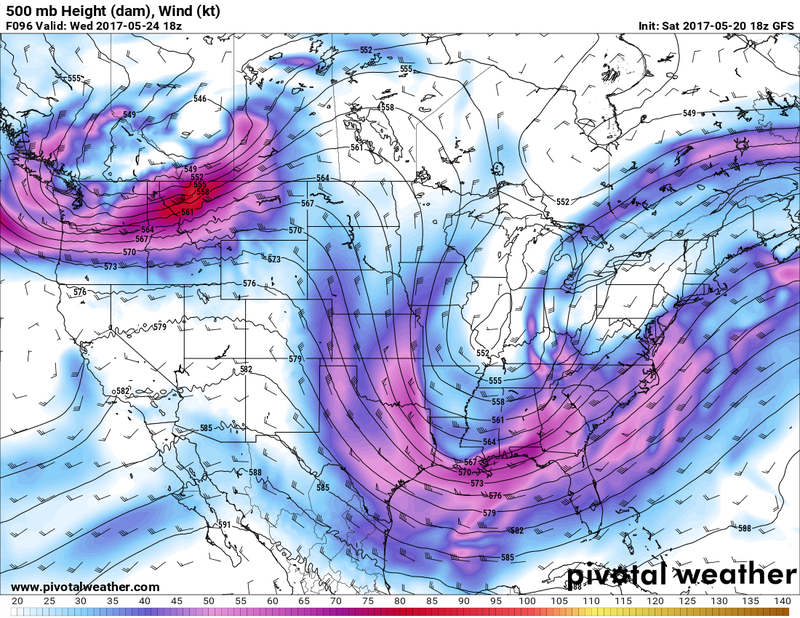 By Wednesday, a large trough of low pressure will occupy in Midwestern states with clouds and showers wrapping around it into the Mid-South. Rain chances are at least as good as Tuesday, if not higher, and it will be a breezy, cool day with temperatures mainly in the 60s. On Thursday, temperatures start to rebound as the trough lifts out. Abundant sunshine will end the week with highs back in the mid 70s Thursday and lower to mid 80s Friday and Saturday, as low temperatures moderate back to the 60s by weeks end. Find the complete forecast on our app or here. Enjoy the cooler week ahead. As we head into Memorial Day weekend, the heat typically starts to build (and this year appears to be no exception) and we'll be looking for ways to cool off!